I don’t really want to talk about day 2. Started out an hour from where I started yesterday. No biggie. I have all the time in the world or the six days the moving van company has allowed me. Driving 1600 miles in that time should be a breeze…right? It was 800am when I exited the building to move the Big Rig. It was 930 when I called uhaul’s roadside emergency hotline to let them know I was stuck between a Cadillac and a hard place. I got out of the Rig to see if there was any way to move further when the nicest man from India asked if he could move the car and help me out. “I cun drive! I cun drive!”, he said enthusiastically. He gunned it forward. He gunned it in reverse. He scared the instant coffee from the lobby out of me. I told him to get out of the cab, but he still insisted on helping me. So, for he stood behind the RIG for the next half-hour and I heard him yelling, ” COME COME COME! GUUD GUUD GUUD! BAK FOWAD!” and I was peeing my pants laughing, fulling knowing that we were getting nowhere and hoping someone was getting this on tape. He was nice as can be, but I was going batty. He only needed about 45 seconds. I was standing about 30 feet from him as he exited the Rig. Something came over me as though I was an impulsive child and I ran to the truck driver and gave him a grateful bear hug. Being as he was solemn and stoic, his arms were stiff at his sides and it was clearly the most awkward hug on record to this date. I was out. Me and The Max were on the road and we were free. Got to North Dakota in good time while singing along to the oldies station and I felt amazing. But, as North Dakota goes it started snowing. We started slowing. 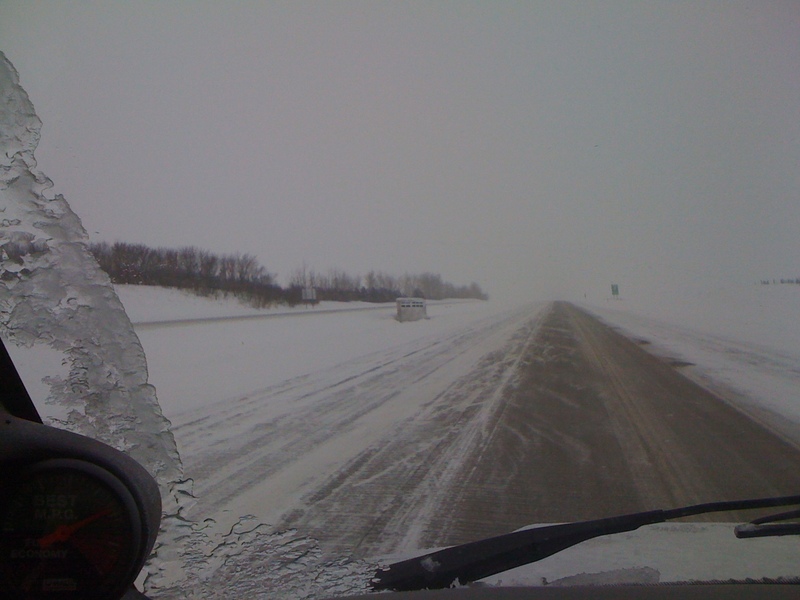 We slowed to about 30 miles per hour and I felt defeated and pulled off to check the weather report. Heavy snow ’til 2am. Crap. I went to the motel I was near and asked if they had any rooms. Course not. I asked where the nearest town was. Forty miles. Forty miles and an hour or so later and the exit to this supposed town was too snowed in to enter. The town after that was another thirty or forty miles so we trudged on. Made it about 250 miles today. Not good. I had to stop not only cause North Dakota has the worst weather God invented, but because an accident was blocking the whole road at one point and they closed the road. I’m beginning to worry about the six day rental. Hang in there, kid. You can do it.